This will take you to the thunderclap campaign. Simply follow this campaign, then share via your Facebook/Twitter/Tumblr accounts in order to add your social reach to the total gained so far (716,000). That’s it, painless. Writers supporting writers. I’m in, are you? If not, please get in. 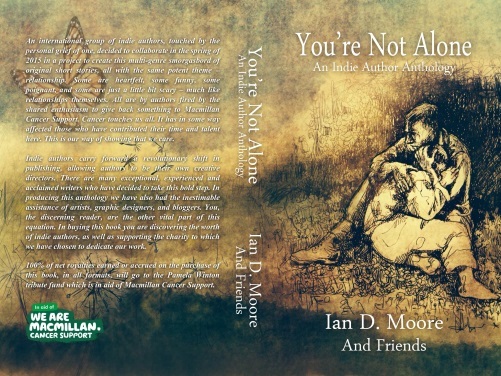 support the group of international authors who came together in aid of WE ARE MACMILLAN CANCER SUPPORT to write this book, “You’re Not Alone – An Indie Author Anthology” of short stories with the theme being relationships. I don’t know anyone who has not been touched by cancer. Last July, I lost two Aunts (sisters) six days apart, both to cancer. What better way, whether writer or reader to get involved and have the opportunity to help others?